The third volume in our new Mythic Monsters series, Mythic Monsters: Oozes brings you a dozen and one sinister scavengers and primordial predators to torment your PCs! Twelve of your favorite oozes are here, updated for the mythic rules, and when we say updated we mean complete stat blocks, yes, but more than that every globbulent horror has its own unique and exciting new mythic abilities, from an mythic id ooze’s psychotropic vapors to a mythic carnivorous blob’s skeletal liquefaction. This product includes mythic oozes of commonplace varieties like the black pudding and gelatinous cube, as well as variants like the electric jelly and white pudding, made far more distinct in their mythic evolutions, covering CRs from 4 to 16. 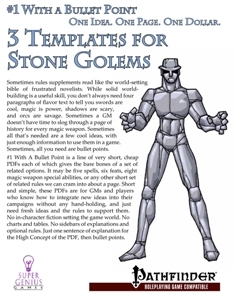 High Concept: Three simple templates to make stone golems a much more interesting and varied group of foes, useful both to match thematic elements of a specific encounter and to surprise PCs when they do something new and unforeseen! Humanity lives in a world filled with light and herosim. But, unknown to all but a few, there lies an another world that comes out when its dark, filled with horrifying creatures and things man was never meant to know about. It’s there that the Pentacle of Shadows lurks, biding its time before taking over the world with dark magics and monsters that lurk within the dark. 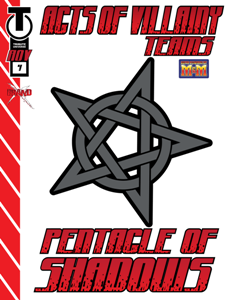 The Pentacle of Shadows, only in AoV: Teams #4 and only $4.99! Feats of Abjuration includes nine new feats for practitioners of abjuration magic: Abjurant Flux, Abjurer’s Abnegations, Arcane Ward, Circles of Resistance, Guarded Spell, Overwhelming Dispel, Resistant Abjurer, Warding Blast, and Warding Shield.